Waffles is a cat of many obsessions. Obvious. Chicken treats, fried chicken, cooked chicken, raw chicken. Chicken, chicken, chicken. We introduced you to his ceiling fixation just yesterday. Ghosts, monsters, the red dot family... someone or something is definitely living in our ceilings. Really anything that's mine From food to toys to loungers and worst of all, my tail. He's got to have a piece of it. Or at least a smell of it. 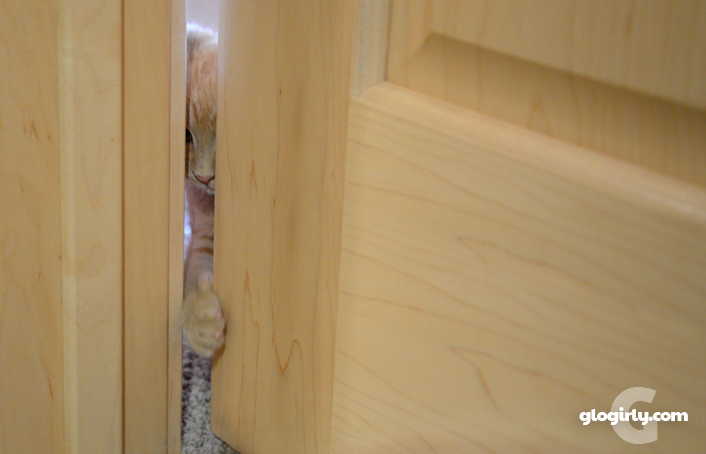 It's quite possible his door obsession can be traced way back to the week he spent in the kitten quarantine room. WAFFLES: Hey YOU! Let me out of here! KATIE: Hey YOU??? Do I look like a YOU? The real question is who in cod's name are YOU and what are you doing in MY townhouse? WAFFLES: Uh, what's a house town? WAFFLES: You mean like New Jersey? KATIE: *sigh* This is NOT a good sign. Life as I know it has taken a very wrong turn. WAFFLES: You took a wrong turn? Are you lost? Maybe you should stop and ask for directionals. WAFFLES: Hey! Where'd you go? Come back! I gotta see what's on the other side of this door! You're having a party aren't you? I can totally tell you're having a party. And thus began the obsession with the other side of the door. Today's photos were taken back in late November, 2012. Waffles had only been with us for a few days and had not yet been outside the kitten quarantine room. 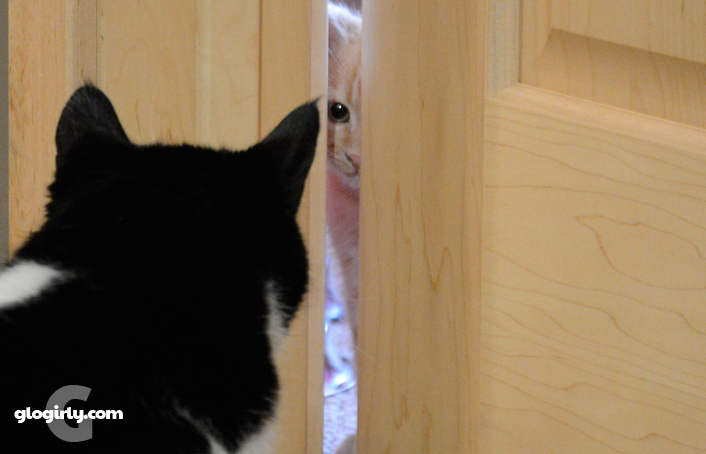 This was the day we decided to crack the door and give Katie & Waffles a glimpse at each other. That second photo is actually the first time they laid eyes on each other. There were a few fireworks. Katie hissed and Waffles, not really knowing what to do, copied her and hissed back. We knew it was going to be a long haul! Ever since Waffles was a kitten and really even more so today, he's completely infatuated with doors. He tries to climb the door frames, catching his back feet in the door jam so he can reach the top. He sits in doorways and yowls. And he loves looking behind the doors, standing up with his feet on them and inevitably closing them on himself. The powder room is his favorite. Earlier this week he locked himself in there THREE times. Later the same evening, we heard a distant door shut and had to go on a Waffles hunt to set him free. Our box of door stops should be arriving from Amazon any day now. 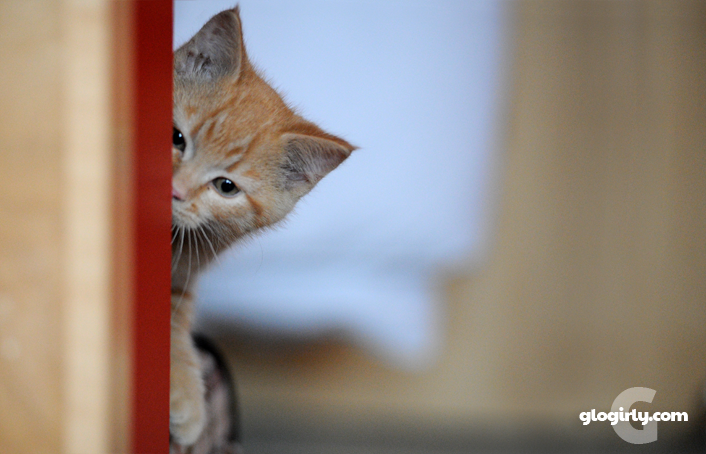 Has your cat ever locked himself in a room or closet? Welllllllll, given that there are no ceilings they really can't get trapped, but Sherpa has shut himself in the bedroom and bathroom. He just finds a way up on to the walls and then finds a way down. Yurt living. It's that ol' grass is always greener on the other side of the fence thing, I think. Treats are always better on the other side of the door? Hmm, I've never been dat interested in doors. Waffles, Waffles, Waffles... what can you do? That's funny, Wally. Polydactyl Tommie always shut doors on himself while trying to open them too. Cute baby Waffles! Waffles sounds like he makes sure those doors are working. LOL. Waffles, you are such an entertaining cat! Keep it up to help the humans maintain their exercise. Oh, and the doorstop idea is a very good one! Waffles sure is unique :) 15 cats and none are obsessed with doors. wow - things in the ceiling, doors banging....anyone else wonder if the townhouse is haunted??? We hate closed doors and let Mom know when she closes one with her on the other side. My brofur, Ocean, did once. He slipped in the bathroom with the door barely ajar. You know how we can do that. He got up on the counter and opened the drawer next to the door. Mom couldn't get in -- the door was closed too much to get her arm or even hand in. She finally got a knife and inch by inch, moved the drawer enough to open the door. Waffles buddy, you are a stitch. You are a comedy act all onto yourself. Poor Katie, what she doesn't have to put up with. he he You always make us laugh. Some kitties here have got locked in the pantry when they follow me in and I don't see them and close the door..
That picture of them first seeing each other is precious! Aww cute baby pictures Waffles! My mum leaves all the doors open. If she dares to shut the bathroom door behind her, I scratch until she or my dad let me in. Ashton has recently taken to sitting behind the door (we posted a photo of her doing it earlier this week) but so far, she hadn't managed to lock herself in anywhere, thank cod. Waffles, at least you're locking yourself in the powerder room, so if you gotta go while you're locked in, you're all set. Hammy still hasn't really figured out how the doors work *sigh* He mews for me when he wants the closet opened. HHGutt locked me in the closet once. TW didn’t even hear e crying or miss me. It was Pop to the rescue. Note to Self: Have Dad buy door stops before Waffles comes to visit. Seriouslies, mommy, these wire-hangers-over-the-door-hinges are kinda embarrassing. Or, you know, we could just let Maxie shut himself in. For the elebentieth time.